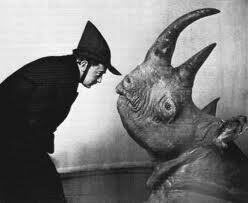 Went and saw Rhinoceros last night at convergence. For those of you unfamiliar with this play, you can read about it on Wikipedia. What is of most interest is the background experiences of Ionesco as he grew and became a man, specifically, his Jewish ethnicity, an ethnicity which the Radical Right in Romania would begin to attack in 1930s under the guise of “illegal immigration” and “fraudulent citizenship.” These themes and ideas should be familiar, as, today, it is clear that they come from a very old playbook. BOTARD: I never believe journalists. They’re all liars. I don’t need them to tell me what to think; I believe what I see with my own eyes. Speaking as a former teacher, I like things to be precise, scientifically valid; I’ve got a methodical mind. BOTARD: Please forgive me, Mr. Papillon. But you can’t deny that the colour problem is one of the great stumbling blocks of our time. BERENGER: You shouldn’t reject medical advice. JEAN: Doctors invent illnesses that don’t exist. BERENGER: They do it in good faith-just for the pleasure of looking after people. JEAN: They invent illnesses, they invent them, I tell you. BERENGER: Perhaps they do-but after they invent them they cure them. JEAN: I only have confidence in veterinary surgeons. LOGICIAN: [to the OLD GENTLEMAN] Here is an example of a syllogism. The cat has four paws. Isidore and Fricot both have four paws. Therefore Isidore and Fricot are cats. OLD GENTLEMAN: [to the LOGICIAN] My dog has got four paws. LOGICIAN: [to the OLD GENTLEMAN] Then it’s a cat. These absurd arguments become all-too-real as Berenger begins to see his own friends and co-workers transform into Rhinos. JEAN: I tell you it’s not as bad as all that. After all, rhinoceroses are living creatures the same as us; they’ve got as much right to life as we have ! BERENGER: As long as they don’t destroy ours in the process. You must admit the difference in mentality. JEAN: [pacing up and down the room, and in and out of the bathroom] Are you under the impression that our way of life is superior? BERENGER: Well at any rate, we have our own moral standards which I consider incompatible with the standards of these animals. JEAN: Moral standards! I’m sick of moral standards ! We need to go beyond moral standards ! BERENGER: What would you put in their place? JEAN: Nature has its own laws. Morality’s against Nature. BERENGER: Are you suggesting we replace our moral laws by the law of the jungle? JEAN: It would suit me, suit me fine. One only need recall Charlottesville and the “fine young men” and their torches to see that greater numbers appear to be turning into rhinoceroses right in front of our eyes. Morality begins to unwind and transform to the Hobbesian “bellum omnium contra omnes”. DUDARD: What if you do? You only have to keep out of their way. And there aren’t as many as all that. BERENGER: I see them all over the place. You’ll probably say that’s being morbid, too. DUDARD: They don’t attack you. If you leave them alone, they just ignore you. You can’t say they’re spiteful. They’ve even got a certain natural innocence, a sort of frankness. Besides I walked right along the avenue to get to you today. I got here safe and sound, didn’t I? No trouble at all. BERENGER: Just the sight of them upsets me. It’s a nervous thing. I don’t get angry–no, it doesn’t pay to get angry, you never know where it’ll lead to, I watch out for that. But it does something to me, here! [He points to his heart.] I get a tight feeling inside. DUDARD: I think you’re right to a certain extent to have some reaction. But you go too far. You’ve no sense of humour, that’s your trouble, none at all. You must learn to be more detached, and try and see the funny side of things. BERENGER: I feel responsible for everything that happens. I feel involved, I just can’t be indifferent. DUDARD: Judge not lest ye he judged. If you start worrying about everything that happens you’d never be able to go on living. BERENGER: If only it had happened somewhere else, in some other country, and we’d just read about it in the papers, one could discuss it quietly, examine the question from all points of view and come to an objective conclusion. We could organize debates with professors and writers and lawyers, and blue-stockings and artists and people. And the ordinary man in the street, as well-it would be very interesting and instructive. But when you’ re involved yourself, when you suddenly find yourself up against the brutal facts you can’t help feeling directly concerned-the shock is too violent for you to stay cool and detached. I’m frankly surprised, I’m very very surprised. I can’t get over it. DUDARD: Well I’m surprised, too. Or rather I was. Now I’m starting to get used to it. Things become more ominous, as Berenger and Daisy become the only humans left. BERENGER: [darting to the radio] Let’s turn on the radio for the news! DAISY: Yes, we must find out how things stand! BERENGER: Things are getting really serious! I tell you frankly, I don’t like it! BERENGER: [very agitated] Keep calm! Keep calm! DAISY: They’ve taken over the radio stations! BERENGER: [agitated and trembling] Keep calm, keep calm! DAISY: It’s no joke any longer. They mean business! BERENGER: There’s only them left now; nobody but them. Even the authorities have joined them. DAISY: Not a soul left anywhere. BERENGER: We’re all alone, we’re left all alone. Berenger attempts to save the world with Daisy, but even Daisy turns in the end, leaving Berenger all alone. BERENGER: How can we save the world, if you don’t? DAISY: Why bother to save it? BERENGER: What a thing to say l Do it for me, Daisy. Let’s save the world. DAISY: After all, perhaps it’s we who need saving. Perhaps we’re the abnormal ones. BERENGER: You’re not yourself, Daisy, you’ve got a touch off ever. DAISY: There aren’t any more of our kind about anywhere, are there? BERENGER: Daisy, you’re not to talk like that! DAISY: Those are the real people. They look happy. They’re content to be what they are. They don’t look insane. They look very natural. They were right to do what they did. BERENGER: [clasping his hands and looking despairingly at DAISY] We’re the ones who are doing right, Daisy, I assure you. DAISY: That’s very presumptuous of you! BERENGER: You know perfectly well I’m right. DAISY: There’s no such thing as absolute right. It’s the world that’s right–not you and me. BERENGER: People who try to hang on to their individuality always come to a bad end! Oh well, too bad! I’ll take on the whole of them ! I’ll put up a fight against the lot of them, the whole lot of them! I’m the last man left, and I’m staying that way until the end. I’m not capitulating ! Once again, a timely play from convergence that was well-directed by Jonathan Wilhelm, with a fantastic set by Wilhelm as well—stark white set-pieces with black and white costumes, which stand in contrast to the muddled mess that humans make of belief and logic. Tom Kondilas is wonderful as the increasingly frantic Berenger, and he even rocks a ‘fro like Gene Wilder in the movie. It’s a long show, but definitely worth seeing. We’ve entered the giving season, so I thought I’d write about one organization, other than Playwrights Local that is, to which I’m giving my money. I’m writing about a black box theater in the Tremont neighborhood of Cleveland. A theater company that changed my theatrical life, and radically altered my perception of how intimate, how powerful, how threatening, and how exhilarating theater can be. I was introduced to convergence-continuum in 2007, when Mike Geither took me to see Chris Johnston’s play Spawn of the Petrolsexuals. The experience was fundamentally altering. Chris wrote a play about a dystopian, bombed-out landscape in which homeless superheroes fought brutal, oil-hungry Commandoids that I can only compare to the Enclave, for those of you familiar with Fallout. There was Angerboy, and Freegrrl, Ingen and Holyman. It reminds me, now looking back, of an early Eric Overmyer play, like Native Speech. The set the convergence created was a character in the play: fabricated steel structures, junk scattered, a broken television set, the massive east wall that was used as movie screen, a motorcycle, a garage door that really opened on Scranton Road, garbage cans, and the trap door near the west wall that leads to the cellar. Lucy Bredeson-Smith, playing Darkangel—-a sort of black sorceress –- opens the trap door leading down to her underground lair and, as soon as she opens the door: the image of Darkangel looking down is on the movie screen east wall. I watch her descend away from me in the theater. I watch her descend toward me on the screen. It was too meta. I was IN a B-movie and IN a real theater experience all at the same time. My head swelled to explode. The production was well-executed, but the feeling was raw. I went back two more times to see Chris’ play because I’d never seen anything like it. And this is what I hear whenever I take someone to convergence who has never been to convergence. The person who accompanies me is blown away, overwhelmed with a theater experience that they’ve didn’t know was possible: to be that close, to be that much a part of the experience, to feel so intensely. Convergence is a true ensemble company. It’s made up of passionate, wholly committed actors, directors, light designers, sound designers, playwrights, video designers, costumers, set designers, painters, box office managers, and musicians—all volunteers: virtually impossible to believe in many ways. And they are all successful!! Critically acclaimed productions! Awards for acting, design, productions! And all working for the production itself, and not some small rapacious little thing like money or notoriety or any self-proclaimed “groundbreaking” aesthetic. So, besides this… why give? convergence-continuum, the theater company, doesn’t own The Liminis, the theater space, in which they create their magic worlds! The Liminis space itself, that was so unique to the production I described above—-the garage door, the trap door, the movie screen wall—-all of the three-dimensional feast of experiences possible in a location—-is at risk. What if theatre weren’t a mirror reflecting the familiar, but an opening into unknown territory? What if there were no fourth wall? What if, instead of going to the theatre to watch a play, you crossed the threshold into the world of the play to experience it? 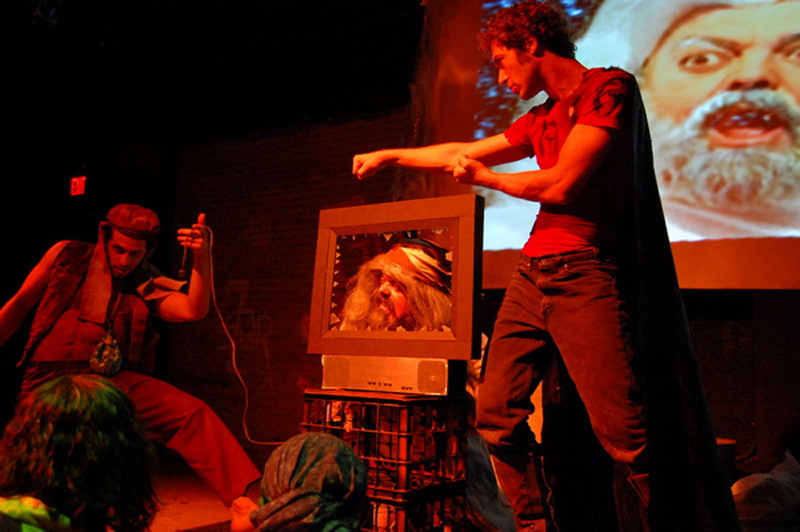 Theatre that expands the imagination and extends the conventional boundaries of language, structure, space, and performance that challenges the conventional notions of what theatre is. What sort of theatre would this be? I’m giving to convergence right now. Please give to them as well.